Gertrude Himmelfarb was married to the late Irving Kristol and together they formed a formidable intellectual partnership in the reassertion of conservative ideas. Himmelfarb, a historian, in this book, brings to the table the debate around poverty in Victorian England. The book was first published in 1991, but represents an important strand of thinking and, indeed, of methodology. One of the many complexities in the polarisation of political and public discourse is that it becomes impossible to have a rational discussion or debate without being compartmentalised into one position or another. We seem to have lost the ability to debate ‘ideas’. Gertrude Himmelfarb’s intellectual history of the ideas, notions and responses to poverty in the Victorian era is broad-reaching, incisive and gripping in both scope and content. The reassertion of the history of ideas – from all parts of the spectrum – would be a great service in our public life. The great strength of the book is in its breadth. 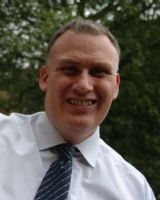 Himmelfarb’s twenty-three chapters range from the work of the social statistician, Charles Booth, to the Salvation Army’s, William Booth, from the rather worthy Charity Organisation Society, to Toynbee Hall and the settlement movement. 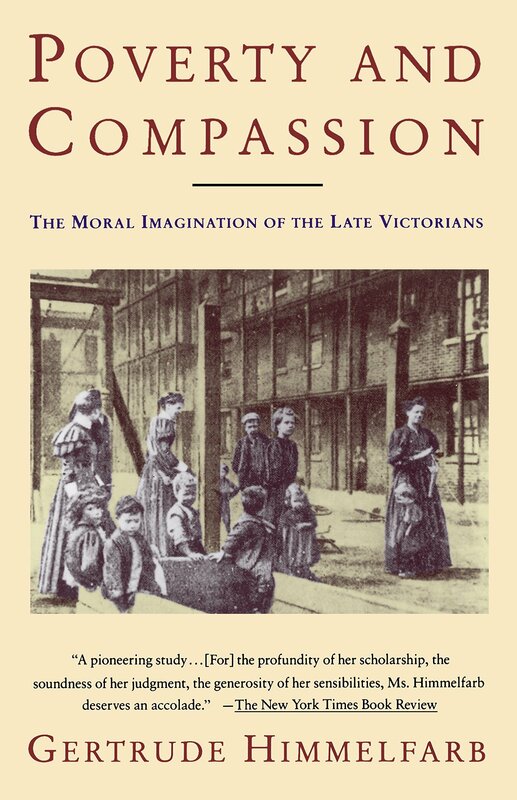 Himmelfarb comes into her own in dealing with the moral ideas of poverty and compassion and how the Victorian era understood these concepts and responded to them both practically and intellectually. So, her assessment of, and interpretation of, the statistics of poverty and what that meant, the literature, the personalities, religious and moralistic responses and the impact of the rise of socialism in various guises are all central features of her exposition of the idea of poverty. Himmelfarb puts this Victorian world under a microscope. A key building block is that “the moral imagination of the late Victorians…was neither sentimental nor utopian” (page 4). This is rather startling as many might think that the very epitome of Victorian ideas was indeed sentimentality. True compassion, she argues, is actually doing good rather than feeling good. The true Victorian philanthropist was moral and humane, interested in the good, not only of the self, but of society, and was shaped by ends that were realistic rather than utopian. This principle allows Himmelfarb to appreciate the extensive variety and range of responses to poverty in Victorian England, and we should thank her for that. The book is divided into five parts, each with a number of chapters. Part 1, “The Arithmetic of Woe”, is a fascinating introduction to the social statistics of the age, the complexity of poverty in late Victorian London, and the particular issues of housing and employment. Conditions had unquestionably improved from the mid-Victorian period and in the discussions around the Bitter Cry of Outcast London, Himmelfarb makes the point that the debate is not whether the ‘abject poor’ had dreadful housing conditions but whether this was generally true of the working classes; indeed, as Lord Shaftesbury’s evidence to the Royal Commission of 1884 suggests, this may indeed not have been the case. Himmelfarb suggests that the Royal Commission failed because it did not deal with this distinction and hence, she argues the question of housing became a social rather than a moral problem and, hence, “a legitimate subject for state intervention” (page 67). Part 2, “Life and Labour of the People in London” develops these themes further including consideration of the work of the social scientist, Charles Booth. In this section Himmelfarb also reflects on some the religious influences upon the debate as well as dealing with what she refers to as “special subjects”, including women and children. Part 3, “The ‘Time-Spirit’: Charity and Philanthropy”, introduces the Charity Organisation Society and the development of benevolence into a science of charity, or at least, as the name implies, its systematic organisation. In this part we also see some of Himmelfarb’s breadth with reflections as diverse as upon the Salvation Army and Toynbee Hall. Himmelfarb argues that if “the mission of the Charity Organisation Society was to organize and professionalize philanthropy, that of Toynbee Hall was to humanize and ‘civilize’ it” (page 243). All of this reflects Himmelfarb’s neo-conservative interests in practical outcomes alongside the debate of ideas. Parts 4 (“Social Philosophy and Social Reform”) and 5 (“’We Are All Socialists Now’”) returns us to the nature of social, economic and philosophical debate at the end of the Victorian era. Essentially, Himmelfarb’s argument is that a proper response to poverty is to recognise that it is a moral question. By moving away from dealing with abject need to the more general situation of the working class, the question of poverty is removed from being a moral problem to a social or political issue. Consequently, the real questions are frequently not dealt with. She argues (capitals in original), that “the ‘DE-MORALIZATION’, as it were, of the problem of poverty was accompanied by a ‘relativization’ of the problem” (page 384). The book cannot be described as an easy read but it is an engaging and wide-ranging one. Indeed, the book makes you think and I had to stop at several places to do just that, think about what I had just read and its implications. My only criticism is that she does not really deal to any extent with Evangelical Christian responses to poverty concentrating more on the development of Christian socialism, which is rather odd given that Himmelfarb was concerned with practical responses as well as theoretical ones. The Victorians are not presented as a solution to today’s problems, but on their own terms, speaking for themselves, in ways we may not have really appreciated because we read back our own presuppositions. She reminds us that poverty “is as protean and diverse as the remedies proposed for it” (page 388). This is a fascinating book which I recommend. Our contemporary discourse would be much improved if we could debate these ideas, their breadth, diversity and their implications, across the traditional political divides, restoring the debate to its proper moral basis. “Poverty and Compassion” by Gertrude Himmelfarb was published in 1991 by Vintage Books, New York (ISBN-13:978-0-67-974173-2). 475 pp.